If you are planning to include wedding day sparklers in your special day, don't make the same mistake so many couples do: to simply buy just enough wedding sparklers for the number of guests they plan to have in attendance. This is done with the idea that you only need to have one sparkler per person. While this might sound right, what happens if one or more of the activities you have planned takes longer to complete than it does for the sparklers to burn out? 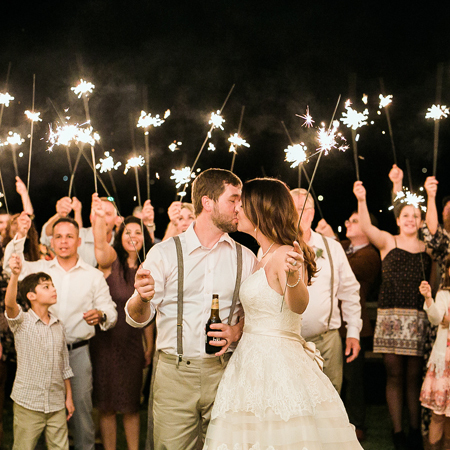 The best way to avoid the risk of your guests not having enough wedding day sparklers to keep them burning during the bride and groom's exit, speeches, or first dance, is to buy them in bulk. Buying in bulk is a great way for you to ensure no one has to sit there with a dead sparkler during your special events. Our 10-inch sparklers are already our lowest-priced option, but if you buy them in bulk, the more you save. These wedding day sparklers are ideal for use as wedding favors, or as decorations as they only burn for approximately 45 seconds. Of course, you can always buy enough of them to make sure your guests have plenty to use if you plan to stick to one size. Double the length and more than double the burn time at 1.5 to 2 minutes, these wedding sparklers are a great choice for longer events. But, you may still find you need to buy enough to make sure each guest has at least two sparklers. If you want wedding day sparklers designed to last through just about all of the events you have planned, you can't go wrong with our 36-inch version. These monsters will burn for a full 3.5 minutes, making them ideal for lighting up that first dance or creating an arched pathway illuminated by showers of golden sparks for the new couple to "escape" down to their getaway car and off on their honeymoon. Along with the standard straight sparklers, we also carry heart-shaped wedding sparklers available for bulk purchase. Having all of your guests holding aloft two of them each can make for an amazing group wedding photo. No matter what type of wedding day sparklers you want for your special day, you can find them at the Wedding Sparklers Outlet online. We also carry wedding cake sparklers and confetti cannons guaranteed to help you create an amazing and magical wedding day celebration that no one will soon forget. We sell in bulk to help keep our prices low and to ensure your guests can have lots of fun with the wedding sparklers throughout the day and into the evening. Our sparklers are virtually smoke free and safe for indoor use.